This week I was afflicted by a cold which developed severe German complications. I should probably start by saying that the cold itself was a mild one. No fever, no sore throat, barely a sniffle… and of course, not being a proper German yet, I haven’t managed to locate my Kreislauf, so that wasn’t upset in the slightest. No, it wasn’t the sort of cold you’d really mention – let alone blog about, if it hadn’t been the start of everything. You see, on Monday morning I had just walked into the kitchen with my colleague, Birgit, when I sneezed violently. It wasn’t a small sneeze… it was one of those eruptive sneezes that come from nowhere like a shotgun going off unexpectedly which scares the chickens two miles away. A sort of nasal explosion. I think it may have shifted the earth’s rotation slightly. Thank Heaven it wasn’t Ruhezeit yet. The impact of this monstrous sneeze made itself instantly felt in the form of a sort of whip-crack in my lower spine. A pain like a bolt of lightening shot from the small of my back to my knees and up to my shoulders. At that moment I became rooted to the spot because suddenly, any movement – like say, breathing or blinking – seemed to cause excruciating pain in my lower spine. The only thing I could do was clutch the nearest chair for support and gasp. Birgit looked at me suspiciously as though I’d suddenly developed leprosy. I could tell from the expression on Birgit’s face that she assumed this to be another piece of British ignorance about the human anatomy. “No… I’ve got a sudden pain here.” I pointed at my lower spine with one hand while still supporting myself on the chair with the other. Birgit’s face eased into an amused grin. In nearly twenty years of living in the Fatherland, I had been under the impression that Germans were relatively competent when it came to medical matters and advanced science. My occasional experiences of German hospitals had always given me the impression that proper diagnosis and the latest hi-tech treatments were on offer. Now, the illusion was crumbling before my eyes. The diagnosis – from a real live university-educated German – was that my sudden pain was caused by a witch’s curse. Moreover, in the absence of anyone else in the building, I had to conclude that the only suspect in the case had to be Birgit herself. In the week running up to Halloween, she was obviously getting her finger in practice, ahead of causing real mischief at the weekend. Germany, of course, has a long tradition of witches and witchcraft – though Halloween is a foreign import. 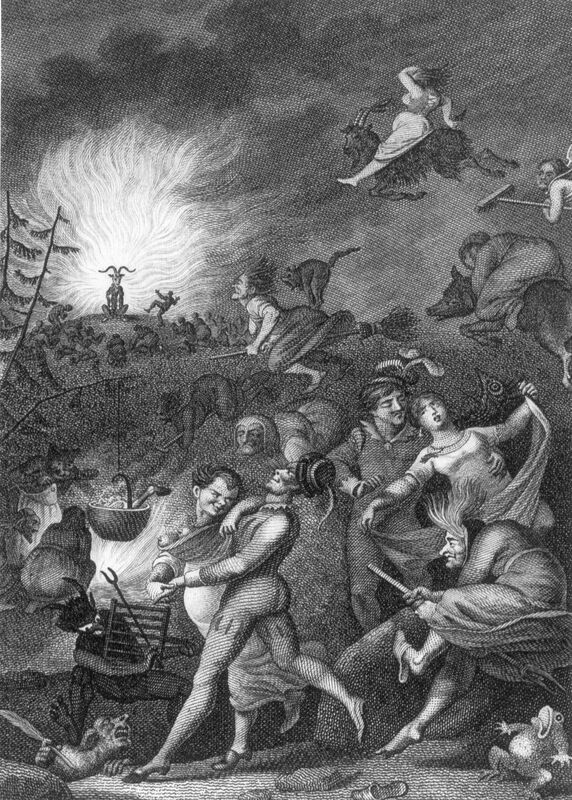 Real German witches focus on Walpurgisnacht on 30th April. I suspect that for German Hexen Halloween just counts as a sort of American theme party. As I hobble over to get my coffee I surreptitiously check Birgit over for broomsticks and pointy hats.There are no obvious telltale signs… but then I guess German witches blend into the general population fairly easily. Yay! We have a winner in our free book giveaway! Before I announce the winner though, I have to declare that there may have been some untoward machinations in the background. Only a couple of days into the contest, I noticed somebody had placed a dead mouse under the kitchen table. A steward’s enquiry found that one of the other cats was behind this dastardly trick. I subsequently banned all felines from entering the contest. Next, I should point out that the decision was somewhat delayed, because you just can’t get the judges these days. On Sunday, when I wanted to get the cat to perform the prize draw… he was nowhere to be found. Of course, my first thought was that someone was attempting to nobble the competition and had journeyed all the way to Meerbusch to bribe him. I assumed he’d be down at Fressnapf being treated to all kinds of premium cat food. But then he strolled in on Monday and settled down on the radiator for a 24 hour snooze and declined to take the contest seriously. So after due deliberation… he selected…*drumroll* Suze! Suze – could you email me the delivery address for your prize and I’ll whack it in the post for you! Oooh! Another exciting new book about Germany! I see that Ich werde ein Berliner has published a book too! Sadly it’s not available in English yet… but for those who follow the highly entertaining blog, if you can manage the German it’s going to be a cracking read. I’m ordering my copy today! Can’t wait! On the subject of ex pat blogs, today is the last chance to vote for your favourite... so if you’re an affectionado of expat musings in Germany, do pop along and click for one of the finalists…. My publisher contacted me the other week with some questions about reaching out to English speaking book lovers in Germany. Of course initially I was suspicious. Exactly what were they trying to flog now? As it turned out, I shouldn’t have worried. My publisher had sponsored a poetry competition among the children of the British Armed Forces on the subject of heroes. Kids from age 6 to young teens submitted their poems… most of them extremely personal and written about their Dads (and a few Mums) in the army. 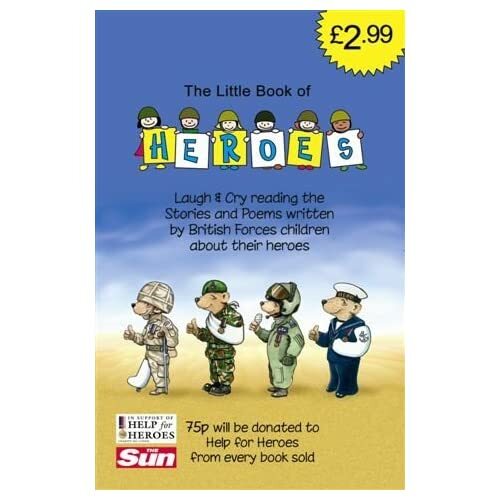 The profits from sales of the book will be donated to Help for Heroes. My publisher even kindly sent me a copy of the book. When I got it I was blown away. First of all… the poems in the book are very very good. And extremely moving. OK – lets face it. If you read it, you’re going to be blubbing into your bedtime cocoa. The poems in this book are poignant in the extreme – and a sharp reminder that when soldiers go to war, their whole family suffers. The burden of pain and fear which these children bear with such stoicism (most of the time) is amazing. Anyway… I have a pristine copy of this book. Not blubbed-on or tear-splashed or snotted-over. And I’m giving it away to one lucky reader of Planet Germany. To enter the draw, all you need to do is leave a comment on this post. That’s it. Simplicity itself! Next Sunday I will put all the names in a hat and my daughter’s cat (the one that looks like Hitler – cat, not daughter, I hasten to add…) will be invited to select a winner.I will then email the winner to get the address to send the book to. And now the small print: The feline’s decision is final. No correspondence will be entered into (the cat may even be illiterate for all I know). 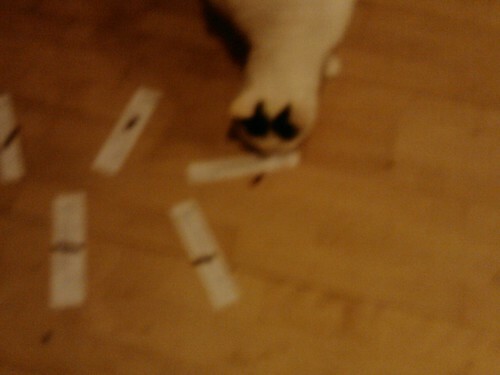 Any attempt to send us mice or other bribes through the mail will mean instant disqualification. The usual rules apply to comments – I will not approve comments which are spam, abusive, attack others etc. yada yada. Comments that don’t get approved don’t get entered in the draw. Basically… be nice. Eldest child has started university in Münster this week. 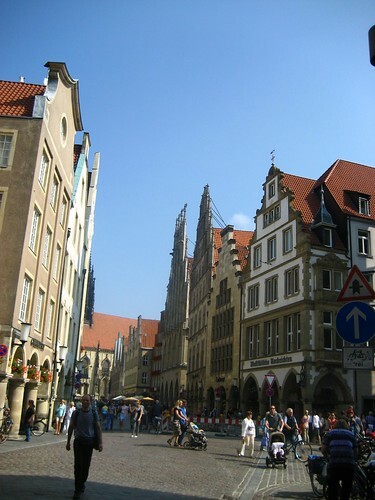 Münster, for those who haven’t had the opportunity of visiting is basically a university with a bit of town attached. Every other building seems to be either a faculty or an administrative building or a hall of residence.And despite having been pretty much flattened in the war, much of the centre has been rebuilt to look as though the allies missed their target completely. With a very ungermanic disregard for the practicalities, Münster has decided this year to renovate several of its student halls of residence. Of course, this is a good thing. At least in theory. In fact for Münster it’s apparently a one-off opportunity, because some of the funding for the renovation has come from the Konjunkturpaket – stimulus money from the government to keep the economy going through the banking crisis. Of course putting the best part of a thousand student rooms out of action at the start of a new university year might not have been the most practical solution as far as the University is concerned. Eldest child is still, a week into term, desperately searching for somewhere to live. Along with many hundreds of other first year students. A lot of them are living in hotels or hostels… or like Eldest, relying on the kindness of strangers who have made their spare room available temporarily. Not every stranger is so considerate though. Today she had an appointment to view a student room in a shared flat 10 km outside of the city (which had been first advertised yesterday). She cycled the 10 km only to find a note stuck on the outside of the door saying “Mitbewohner bereits gefunden” (room already let). I hope she remembered to write an appropriate reply (either English or German vernacular would do!) on the door, before cycling the 10 km back…. 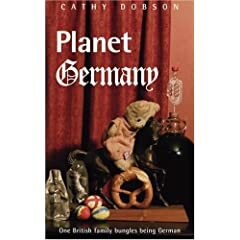 It would appear that Planet Germany, along with a very excellent selection of other ex pat blogs, has been shortlisted for the accolade “Best German Blog”. Obviously I would be delighted if any of my readers here would be kind enough to pop over to Go Overseas and vote for Planet Germany. But I would also be pleased, if you use this as an opportunity to check out some of the other very excellent blogs on the list too. Many of the writers are online friends of mine – so I’ll also be happy if they win the ultimate accolade too. Of course, as we’re all here in Germany, we should really run this as a duel… complete with Renommierschmisse. Perhaps I should lay down the gauntlet and suggest the weapon. Ladies and Gentlemen…. Bratwursts at dawn?